How do I convert to save only the audio? 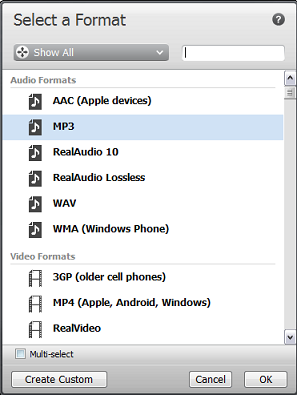 Converting your downloaded videos to .mp3 files will put these songs in the music view of your RealPlayer Library. From there you can create a playlist or burn a CD. In the RealDownloader window, move the mouse over a downloaded video in the list. In the RealPlayer Library, right-click on the video you want to convert. Click the field under "Convert to..."
Under Audio Formats, select MP3. This might be cumbersome the first time if you have a large video collection, but it only has to be done once. In the RealPlayer Library, click Photos & Videos on the left. On the top-right, click the drop-down (it says "Timeline" by default). Select Folder. Scroll down, and look for Videos\RealTimes\RealDownloader or Videos\RealPlayer Downloads\. While pressing the CTRL key on your keyboard, click to select the videos you wish to play as music. Right-click the selected videos. Select Edit > Convert. RealTimes Converter opens. Click the big silver button. Type "MP3" in the box on the top-right. MP3 should appear below. Click MP3. Files will automatically be added to the Library under Music.